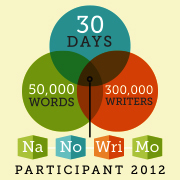 It’s thirteen days into NaNoWriMo, and I’m stuck at just under 3000 words (I should be near 25,000 by now). Part of it is because I’m just so busy: stupid job that allows no time for writing, trying to get to the gym a few times a week, searching and applying for jobs, helping my brother with the GED, and beginning my application for grad school. But I realized today that a big reason for my procrastination is that my story has no overarching theme. Right now, it’s just a steampunk mystery thriller. My other two novels both had universal themes. The Lone Wolf is a story of love and betrayal, forgiveness and redemption. A Handful of Wishes has two themes: growth over a lifetime following Kolberg’s stages of moral development, and the destructive power of pride, through the genie Paribanu’s story. When I write short stories, I don’t focus on theme; I just write, and usually something emerges. Then it’s picked up on by critiquers, and I develop it more deeply during edits. But my novels are different. I need a deeper purpose while writing. My NaNo novel has nothing, and until I figure out its message, I don’t know how far I can get. Do you prefer books with meaningful themes, or do you want a story to be just a story? For the writers out there, do you try to put a theme in your works? And once it’s there, do you try to develop it more deeply, or do you keep it subtle/barely noticeable? Today’s six are from my NaNoWriMo novel (which isn’t progressing as quickly as it should be, and is also part of the reason posts are light this month). I’m trying steampunk this year. Literary steampunk. Branko Radic is a Serbian inventor/Nikola Tesla knockoff working on an invention that will revolutionize the world. And of course, everyone wants it – good and bad guys will stop at nothing to get it. When he goes missing, a senator’s daughter, her fiancé, and an architect from our non-steampunk world race to find him and recover his invention. Branko has just gotten his invention working when some goons pay him a visit. The two thugs move towards Branko, toppling lab equipment and disconnecting wires as they go, and Branko realizes he’s trapped. He lunges for the remote and spins the dial to “S.” Just as the men are about to reach him, he aims the remote at the mirror, presses the red button, and disappears. In honor of NaNoWriMo, which starts in four days and for which I have yet to prepare, this week’s six come from the very first novel I wrote, back in November of 2009. It’s a hero’s quest roughly based on Zoroastrianism and leads up to a big battle between the forces of good and bad. I think the premise is good, but the writing is horrible; maybe someday I’ll rewrite the whole thing. In this scene, Claire has just found out she’s a deva (a heavenly being a step below an angel) and had her powers and true form restored. According to the website, there are six days until the start of National Novel Writing Month. I was all set to work on the novel I’ve done the past two years, A Handful of Wishes. It’s plotted. I know the characters and the setting. I could totally finish it this year (I’m about 13k into it, aiming for about 80k). Instead, this weekend a scene came to me from the end of a novel I’ve been kicking around for a year or so. I can see the characters clearly. I know what they’re saying, what their motivation is, how the story ends and why. And I know I have to write this scene, soon. So I’m throwing out all my prep work and instead writing a steampunk novel. I’ve read a couple steampunk books, enough to have a feel for the genre. Kind of. But that’s okay, because this novel is half in our world, half in its steampunk twin. When Dennis Holmes’ girlfriend Mariella Happer, daughter of a powerful senator, goes missing, he discovers she’s been taken from his world to a parallel world as part of a political plot to gain control not only of his New York City but all New York Cities. Trapped in our world, Mariella inadvertently gains the help of bored, self-absorbed architect Eric Culver. Together the three must race against time to return Mariella where she belongs, or risk the destruction of all life as we know it. It’s going to be action-y, with a political mystery and romance and all kinds of genre-bending, and a bit of influence from Neil Gaimon’s Neverwhere, at least initially as I write it. I have six days to figure this bad boy out. I predict I will crash and burn, fairly quickly. Are you ready for this year’s NaNo? Only a couple months until NaNoWriMo, so I thought I’d revisit the novel I’ll be working on (for the third consecutive year), A Handful of Wishes. This scene takes place in 1963, when Zeke is 18. He’s just had a fight with his girlfriend, Julia Weslewski, the younger sister of the guy who bullied Zeke when they were kids. My final word count was 13,767. I averaged 458 words per day. I wrote something 14 out of 30 days. Not one day did I manage to write the 1667 needed to keep on track. Overall, it was a pretty pathetic showing on my part. I had a strong (relatively speaking) start, but then pretty much crapped out as the month progressed. My muse is a jerkwad. There were days when I sat in front of the computer but couldn’t think what to write. I know the whole point of NaNo is to just get it out there, but I couldn’t even do that. I have a hard time forcing myself to do something I don’t want to do. Sure, there are days when I don’t want to go to work and I do that, but hobbies are different. It’s not that I’m fickle, necessarily, just that I go in spurts. I’ll throw myself into something for a couple weeks or months, then move onto something else. It’s not that I’ve lost interest; it’s just something else is now more important to me. I won NaNo in 2009, and that novel is crap. Pure, will-never-see-the-light-of-day, let’s-pretend-it-never-happened crap. I wrote it in 30 days, and it shows. Granted, it was my first attempt at a novel, but it was still pretty bad. My first real novel, The Lone Wolf, took nine months to write, as well as a year to edit. I do much better writing when I’m not under a word count deadline. That being said, I’m still glad I did NaNo this year. And I’ll probably do it again next year, with the same results. Did you NaNo this year? How’d you do? Any thoughts to share on the whole process? Seeing as how it’s almost the end of NaNo, I’ll go for one more scene from A Handful of Wishes, this year’s novel about Zeke and his genie, Paribanu. Zeke took her chin in his hand again, gently this time. Paribanu stood completely still, looked straight into his eyes. Another chunk from A Handful of Wishes, this year’s NaNo novel. In this scene, Zeke is twelve. “Ezekiel Thomas Archer, what in God’s name is going on up here?” asked his aunt as she stared straight at Paribanu. “Aunt Keira, I can explain,” exclaimed Zeke, bolting upright and away from Paribanu, who remained calmly at his side. “Oh?” asked his aunt, cocking an eyebrow at him. He couldn’t, of course. How could he explain a strange girl sitting beside him, especially one dressed as exotically as Paribanu? How could he explain that he had his own wish-granting genie? Another NaNo bit from A Handful of Wishes. Zeke’s wife has just left him, and the genie can’t make her come back.